Plot: The latest blockbuster, Frozen , mainly tells the story of a fearless princess Anna who embarks on an epic journey with a thrill-seeking mountain man, his loyal reindeer, and a hilarious snowman to find her estranged sister Elsa and to put an end to her icy spell that has trapped the kingdom in permanent winter. Albeit encountering Everest-like conditions, they still struggle to battle the adversity in a race to salvage the kingdom from destruction. This flick pockets $110.6 million worldwide on its opening weekend on Nov. 27, 2013 and grossed $1.276 billion box office finally. Disney's record-breaking musical behemoth Frozen has won the best Oscar movies in animation section the 86th Academy Awards. It's so warmly-received that many a movie buff surges to Amazon to preorder Frozen DVD version. If you are just one entrant of them and aspire for a free solution to rip DVD Frozen to MP4 format so that you can play the Frozen DVD on on iPone 7/SE/6/5S, iPad Pro/mini 4, and more portable gadgets for convenient watching on the move, you are apt to seek for a free DVD ripper, like Handbrake, Mac The Ripper, etc. To disappoint you, Handbrake fails to rip Disney DVD movie Frozen since this Disney-produced DVD is, with no exception, protected by the latest Disney X-project protection. To be exact, The disney DVD frozen may come with 99 titles that many other ordinary DVD rippers fail to choose the right title or even crush during DVD ripping. Handbrake lacks the function of decryption so that it has no choice but to quit. Later, you may shift your trust to Mac The Ripper. Yet, it says that the Disney disc is oversized when it tries to scan it. Several trials later, it scans the Disney disc but the top and bottom items are supposedly over 4000 GB each. Can you believe this DVD ripper can rip Disney DVD Frozen? · Rip Frozen DVD to iPhone iPad Android MP4 etc. Never mind! There exists an ideal Disney DVD ripper - MacX DVD Ripper Pro, which can easily bypass any copy protection even the latest Disney X-project protection to clear the so-called "Disney movie oversized", "over 4000GB on each file", "wrong title from 99 titles" and more Disney DRM issues. Thus, ripping the best Disney movies DVD Frozen to MP4 on Mac is as easy as rolling off a log. And it can fast and stably rip and convert DVD Frozen to MP4 on any Mac OS platforms even Mac OS X El Capitan and macOS Sierra. Plus, this Frozen DVD to MP4 ripper also surprises you at its mighty knack of backing up Frozen DVD to MKV insurance of DVD Frozen eternal keep. The humanized Mac-user interface will walk you through the DVD Frozen to MP4 ripping process on Mac just in a few mins. Step 1: Download the Disney movies downloader and run it on Mac. Then import DVD Disney Movie Frozen by clicking "DVD Disc" button. Step 2: Choose the output format as MP4 from "General Video" Option. Or directly iPhone iPad Android devices for mobile playback. Tips: Please choose "Use High Quality Engine" at the lower right corner of the windows to ensure a faultless Disney Frozen DVD ripping on your Mac. Attention shall be paid that the DVD ripping under Safe Mode takes a little more time than normal mode. Step 3: Click "Browse" button to save your ripped DVD Frozen film. Step 4: Click "RUN" to begin ripping DVD Frozen on Mac. Notes: In addition to perfectly converting DVD Frozen to MP4 on Mac, this DVD to MP4 converter also empowers you to rip other non-standard DVDs like workout DVDs, fitness DVDs, Beachbody DVDs, yoga meditation DVDs, AV Japanese DVDs, damaged/unplayable DVDs to MP4 MOV MKV AVI FLV iPhone iPad Android with 350+ profiles in 5 mins (250-320 FPS) for high-end computers, all thanks to its secret weapon - Intel QSV hardware acceleration tech. Still, if you are crazy about the music Let It Go in the Frozen DVD, you can simply extract the Let It Go music from Disney Frozen DVD to be saved as MP3, AAC, AC3, etc. In addition, you can count on MacX Video Converter Pro as well to download Let It Go music or Frozen movie from YouTube for playing offline. You can surely enjoy your beloved Frozen on Mac or Windows computer. However, there are also times when you wanna watch Frozen movie on iPhone iPad on the go. For this purpose, MacX MediaTrans works like a charm on transferring Frozen movie to iPhone iPad, regardless of format issues. All these attributed to the built-in auto converting function of the iOS iPhone transfer, which not only allows you to copy iPhone video format movies like MP4, but also other formatted videos such as MKV, AVI, FLV, M2TS etc. to iPhone iPad devices. There are plenty of animated DVD movies. Here we listed some new animated movies on DVD movies with animated feature and 10 best animation DVD movies for kids of all time for you to enjoy with your kids and family. How to make copies of protected DVD to DVD on Mac OS? 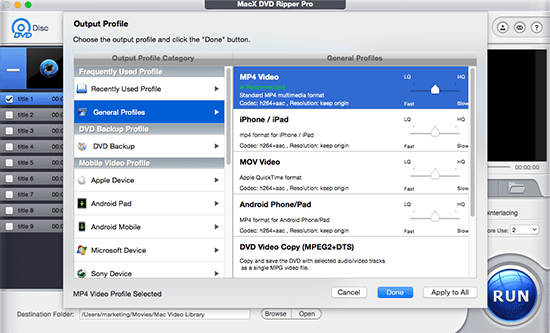 MacX DVD Ripper Pro allows you to rip protected DVD to video TS so that you can burn Video TS to DVD for a backup. Copy protected DVD to DVD for Mac ( macOS Mojave included) in a few clicks. Note: Ripping and converting commercial DVDs are only for personal legal use. Please comply with your local DVD copyright law and apply the DVD contents for fair use.